It was touching to hear a group of grown men emotionally talk about the late Franca Sozzani, the "Grand Dame of fashion" as Carlo Calenda, the Italian Minister of Economic Development called her during the opening ceremony of Pitti Uomo's 91st edition. From Calenda, to Gaetano Marzotto, President of Pitti Immagine, the power men of the Made in Italy fashion world gushed about a woman -- a strong, powerful, intelligent and unafraid to be so woman. 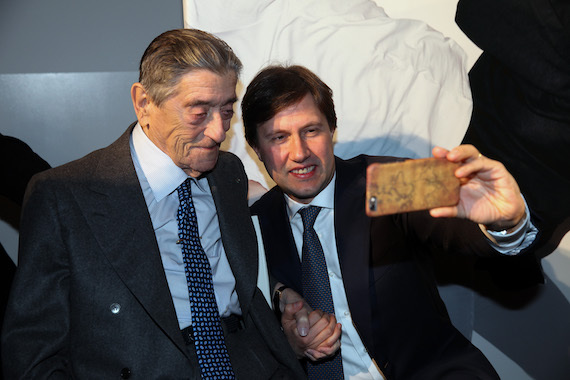 Sozzani's spirit of support for younger generations, her untiring resolve to make sure "that fashion would enter into the very DNA of our country [Italy]," as Calenda explained further, certainly are palpable at this edition of the menswear fair in Florence. And the gap left by her absence is undeniable. "I've never stopped dreaming!" Sozzani admitted in Venice, during a press conference for her son Francesco Carrozzini's film Franca: Chaos & Creation last September. At the height of her struggle with the illness that took her away from us, from this world now a bit more unfashionable because she's not around, she was still dreaming of helping fashionistas gain the respect they deserve. During the opening ceremony to kick off the presentations of Fall 2017/Winter 2018 collections for men, Florence Mayor Dario Nardella also talked about Chinese artist Ai Wei Wei. Ai's art installation of orange rafts frames the Palazzo Strozzi, just a few hundred meters away from where the Mayor gave his speech. The artist's work with migrants in the last couple of years makes up the bulk of the exhibit inside the Palazzo and from the look of some of the collections at Pitti Uomo, where gold foil and waterproof jackets are in abundance, it seems the refugee crisis, the constant mention of it in the news has influenced fashion design as well. Mayor Nardella shared, "I remember when a journalist asked the artist [Ai Wei Wei] what is the word that you find decisive for the world at the moment, and he replied 'Action'. The world belongs to those who act. Determination, this is Pitti Imagine Uomo." He's right. If US politics has taught us anything in the last couple of months is that making mistakes, but making them loudly and with conviction, can even secure a Presidential election. Eton and the irreverence of true style. Back at the Fortezza, I caught up with the powers that be at one of my favorite brands, Swedish shirt house Eton. Apart from their classy behavior, time and time again, and social involvement in important causes, I've developed a soft spot for their classic, good looking shirts and the innovative ways they portray men, modern men in their campaigns. But Eton also has a truly irreverent vein, one that appeals to the closet-rockstar in me. This season, their 'Haçienda Collection" features soft, graphic printed shirts that could be worn by men and women alike, inspired by the underground culture of The Haçienda in Manchester, an iconic British nightclub of the 80s and 90s. 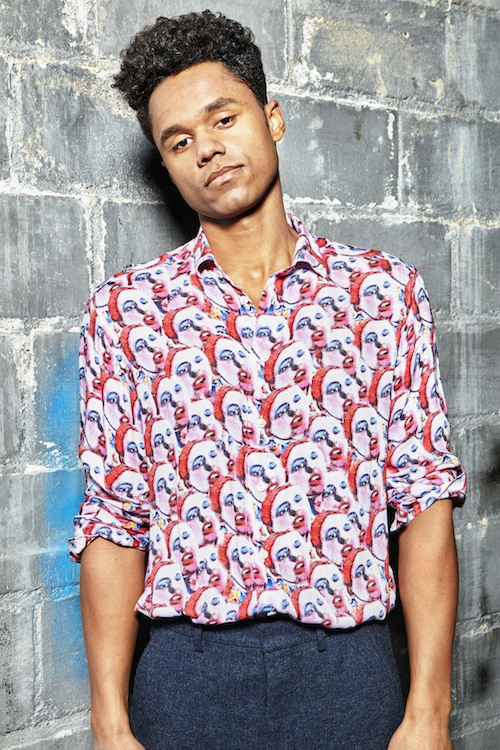 My personal favorite from the capsule collection is this 'Party People' shirt pictured above, featuring faces that hauntingly remind me of Edie Sedgwick, seen through the eyes of Andy Warhol. Sebastian Dollinger, head of design at Eton, explained "my wife is a very classy, classic dresser but she immediately took parts of that collection, first because of the material -- a viscose-y, light sort of thing -- and also because the patterns are out there!" Of course, the brand's bread-and-butter remain their more traditional shirt designs, pocket squares and scarves, but as they say, unless you move forward constantly, you'll find yourself stuck in the past, and Eton is ever reinventing style, with their tried and true customer in mind. Ciro Paone, Kiton and the essence of being Neapolitan. If you ask a person born in Naples if they are Italian, you will see them stare back at you in disbelief and, a bit harassed, they'll eventually answer, "No! I'm Neapolitan!" Having grown up with a Parthenopean mother, as a child I found it baffling that she thought it an insult to be mistaken for Florentine or even simply Italian. Until I grew up, and realized the true power of hailing from one of the most magical, infuriatingly creative and wonderfully chaotic cities on earth. To those who doubt my passion when I write, I say, visit Naples and as the saying goes, "vedi Napoli e poi muori" once you do, you can die in peace. You'll have then really, truly, absolutely seen it all. Kiton, the brand born out of the perfectionist eye of Ciro Paone, is a perfect example of Neapolitan style. "Plus one" is Paone's infamous saying, meaning everything can be reworked again, to add one more stitch, take away one more centimeter so that the garment reaches perfection. And perfection Paone has achieved, in his 80-some years, so much so that he's managed both a Career Award and a personal tribute exhibit at this year's Pitti Uomo. "Due o tre cose che so di Ciro" (Two or three things I know about Ciro) is a voyage into Ciro Paone's life, curated by Italian fashion journalist Angelo Flaccavento and featuring Paone's sayings, philosophies and most beloved possessions. My favorite was room 3, the Naples room, dedicated to the contradictions that make up the grandiose city of my mom. Featuring a "Madonna Scotchata" -- a game of words which ends up translation as both a "bored Madonna" and a Madonna obviously taped with scotch tape -- the room made me giggle at all the contradictions that make up my own personality, thanks to my Southern heritage. Speaking of Madonnas... There's a scent for that! I'll admit, I'm not a huge fan of religions, of any kind. But the scent of incense, a particular kind of church incense, always reminds me of my childhood, even if my family only stumbled into church for christenings, weddings and funerals. And walking around a new section of Pitti Uomo, a welcomed respite from the business of fashion called Hi Beauty, I found a brand based in Rome that takes inspiration from "The Scents of the Bible" in their latest collection. Essenzialmente Laura features three perfumes in this capsule collection, one called "Incense of the Churches of Rome", the smell that drew me in at hello, "Nard of Mary Magdalen" and "Mystic Rose" -- the latter probably the perfume I'd choose for personal use. After all, a woman can never have enough rose perfume, I say. I loved hearing the history behind the brand, and discovering the various scents and I'll look for the shop, in Via dei Coronari in Rome, the next time I'm in the Eternal City. Golden Goose Deluxe Brand and their fabulous golden jackets. Even since I started attending the Venice Film Festival, I've realized that Venetians are just classy people. Period. And last night, at the Venetian brand Golden Goose Deluxe Brand fashion presentation, inside the iconic Stazione Leopolda, the concept was confirmed further. Once we arrived inside the venue, we were greeted by a trio of cylinders which made the place look like a scene out of Denis Villeneuve's Arrival. I felt aliens or astronauts couldn't be far behind... And in fact, as soon as the music began, a spotlight started shining on a white, skateboarding moon walker, covered from head to toe in astronaut gear. But then, the music got louder, a bang exploded and skaters in gold foil jackets that looked phenomenal started using the cylinders for an exhibition in talent and balance. All the while, a Japanese DJ, channeling a Jamaican rasta in a club of the Lower East Side in NYC in the 90s, played tune after tune of delightfully cool music. So far so good. This is Pitti Uomo after all and great things, wonderful presentations happen every day here. We're used to that. But what came after even the most jaded fashion journalist couldn't imagine. We got the jackets! 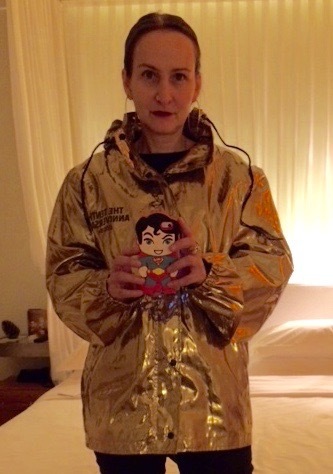 Yes, those jackets, the gold foil phenomenal looking things that are featured on the homepage of the brand's website. All we had to do was put in a gadget key we received upon entering the venue, digit "53" in the machines that looked like candy dispensers, and the jackets, by the famous sneaker brand, were ours. Just. Like. That. As I walked into my hotel room, tired and with my feet swollen beyond recognition, all I could do was try on the jacket. I felt like I'd just celebrated Christmas a second time. And you know what, that thing is even cooler in real life! GGDB image by Giovanni Giannoni for Pitti Uomo, all photos used with permission.